Photomath: Maths Questions Solution Application: Simply point your camera toward a Photomath problem and Photomath will magically show the result with a detailed step-by-step instructions. Photomath supports arithmetic, integers, fractions, decimal numbers, roots, algebraic expressions, linear equations/inequalities, quadratic equations/inequalities, absolute equations/inequalities, systems of equations, logarithms, trigonometry, exponential and logarithmic functions, derivatives and integrals. 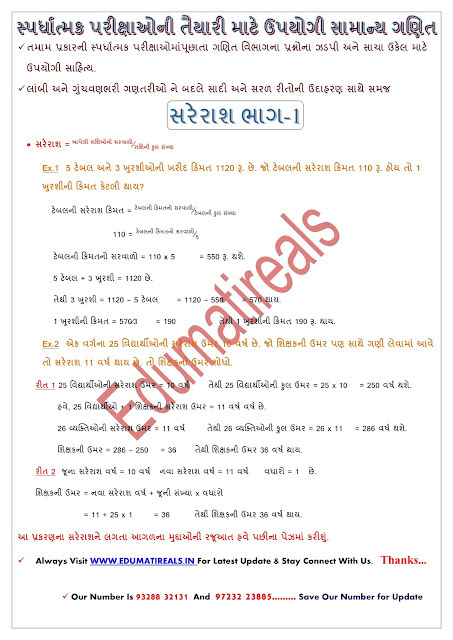 Special Aavakar Gk Page for Your Next Competitive exam. We are just doing help to our visitor for preparation of exam so always visit Our site to get exam Shortcut Tricks are very important things in competitive exam. Aptitude Shortcut methods and tricks for the problems related to Age Calculation were given below to see. 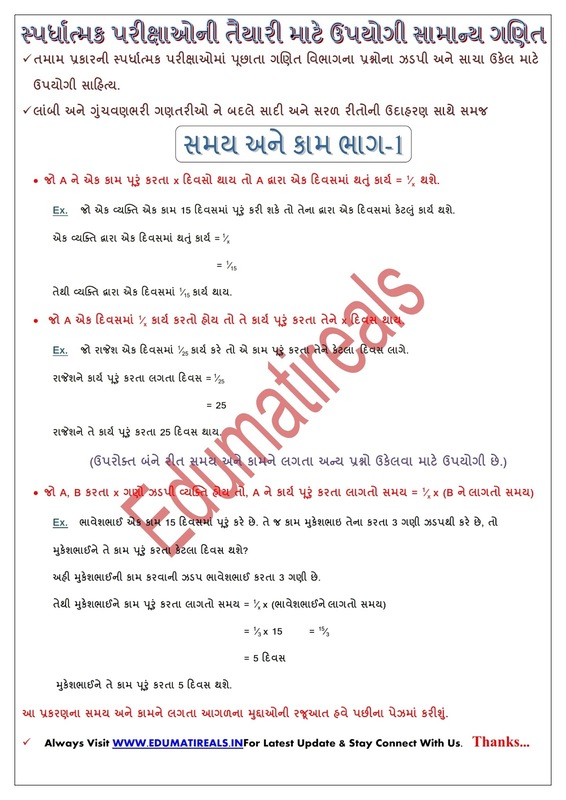 Candidates those who are preparing for all competitive Exams can use this method. Sometimes percentages can be frustrating because it’s not always easy to remember what we learned about them in school. Let Excel do the work for you – simple formulas can help you find the percentage of a total, for example, or the percentage difference between two numbers. If you know time management then everything will be easier for you. Most of us miss that part. Few examples on average shortcuts is given in this page below. We try to provide all types of shortcut tricks on average here. We request all visitors to read all examples carefully. These examples here will help ou to better understand shortcut tricks on average. Maths Tricks : Tips and Tricks to Solve Quantitative Aptitude Test Questions on Time & Work PART -5 : Special Avakar Gk Page for Your Next Competitive exam. We are just doing help to our visitor for preparation of exam so always visit Our site to get exam Shortcut Tricks are very important things in competitive exam. Time takes a huge part in competitive exams. If you know time management then everything will be easier for you. Most of us miss that part. Few examples on average shortcuts is given in this page below. We try to provide all types of shortcut tricks on average here. We request all visitors to read all examples carefully. These examples here will help ou to better understand shortcut tricks on average. Time & Work calculation shortcut tricks are very important thing to know for your exams. Time is the main factor in competitive exams. If you know time management then everything will be easier for you. Most of us skip that part. Here in this page we give few examples on Time & Work calculation shortcut tricks. 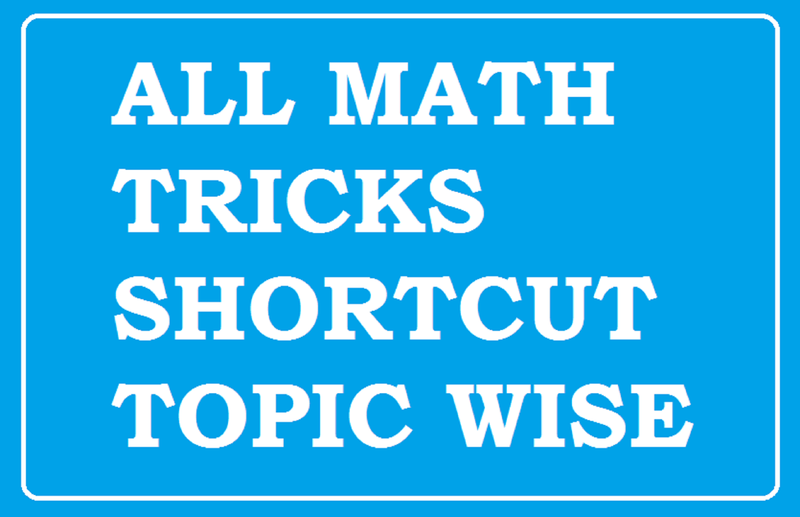 These shortcut tricks cover all sorts of tricks on Time & Work calculation. Visitors are requested to carefully read all shortcut examples. These examples here will help you to better understand shortcut tricks on Time & Work calculation. Maths Tricks : Tips and Tricks to Solve Quantitative Aptitude Test Questions on Time & Work PART - 4 : Special Avakar Gk Page for Your Next Competitive exam. We are just doing help to our visitor for preparation of exam so always visit Our site to get exam Shortcut Tricks are very important things in competitive exam. Time takes a huge part in competitive exams. If you know time management then everything will be easier for you. Most of us miss that part. Few examples on average shortcuts is given in this page below. We try to provide all types of shortcut tricks on average here. We request all visitors to read all examples carefully. These examples here will help ou to better understand shortcut tricks on average. Maths Tricks : Tips and Tricks to Solve Quantitative Aptitude Test Questions on Time & Work PART - 3 : Special Avakar Gk Page for Your Next Competitive exam. We are just doing help to our visitor for preparation of exam so always visit Our site to get exam Shortcut Tricks are very important things in competitive exam. Time takes a huge part in competitive exams. If you know time management then everything will be easier for you. Most of us miss that part. Few examples on average shortcuts is given in this page below. We try to provide all types of shortcut tricks on average here. We request all visitors to read all examples carefully. These examples here will help ou to better understand shortcut tricks on average. 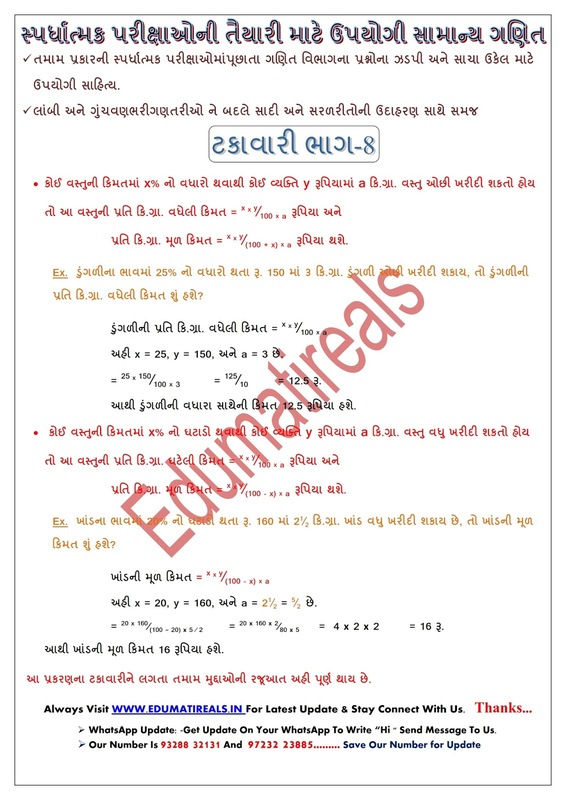 Maths Tricks : Tips and Tricks to Solve Quantitative Aptitude Test Questions on Time & Work PART - 2 : Special Avakar Gk Page for Your Next Competitive exam. We are just doing help to our visitor for preparation of exam so always visit Our site to get exam Shortcut Tricks are very important things in competitive exam. Time takes a huge part in competitive exams. If you know time management then everything will be easier for you. Most of us miss that part. Few examples on average shortcuts is given in this page below. We try to provide all types of shortcut tricks on average here. We request all visitors to read all examples carefully. These examples here will help ou to better understand shortcut tricks on average. Maths Tricks : Tips and Tricks to Solve Quantitative Aptitude Test Questions on Time & Work PART - 1 Click Here For Old Maths Tricks Page Time & Work calculation shortcut tricks are very important thing to know for your exams. Time is the main factor in competitive exams. If you know time management then everything will be easier for you. Most of us skip that part. Here in this page we give few examples on Time & Work calculation shortcut tricks. These shortcut tricks cover all sorts of tricks on Time & Work calculation. Visitors are requested to carefully read all shortcut examples. These examples here will help you to better understand shortcut tricks on Time & Work calculation. Profit or Gain: If the selling price is more than the cost price, the difference between them is the rofit incurred. 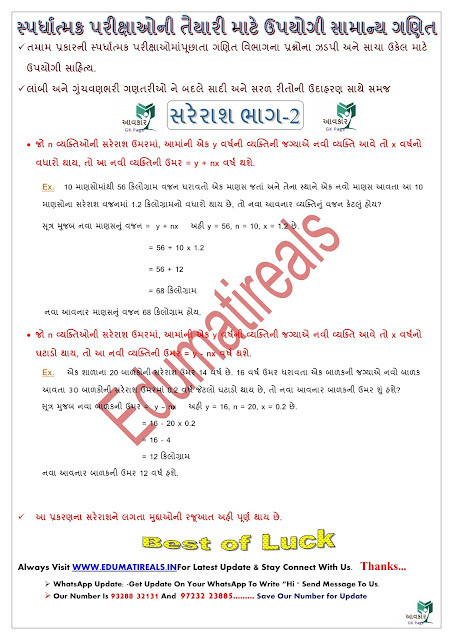 Maths : Profit & Loss - 3 in Gujarati : Special Aavakar Gk Page for Your Next Competitive exam. We are just doing help to our visitor for preparation of exam so always visit Our site to get exam Shortcut Tricks are very important things in competitive exam. Aptitude Shortcut methods and tricks for the problems related to Age Calculation were given below to see. 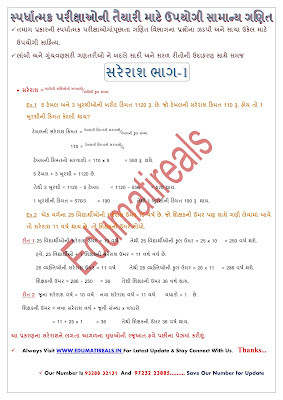 Candidates those who are preparing for all competitive Exams can use this method. If you know time management then everything will be easier for you. Most of us miss that part. Few examples on average shortcuts is given in this page below. We try to provide all types of shortcut tricks on average here. We request all visitors to read all examples carefully. These examples here will help ou to better understand shortcut tricks on average. As you guide your child you should also take the opportunity to explain the importance and relevance of percentage calculations: pay rises, allowance rises, interest rates, discounts on sale items etc. Learning is always improved when the relevance of what is being learned is appreciated. Percent means “for every 100” or "out of 100." The (%) symbol as a quick way to write a fraction with a denominator of 100. As an example, instead of saying "it rained 14 days out of every 100," we say "it rained 14% of the time." Percentages can be written as decimals by moving the decimal point two places to the left: Sometimes percentages can be frustrating because it’s not always easy to remember what we learned about them in school. Let Excel do the work for you – simple formulas can help you find the percentage of a total, for example, or the percentage difference between two numbers. Our site to get exam Shortcut Tricks are very important things in competitive exam. Time takes a huge part in competitive exams. If you know time management then everything will be easier for you. Most of us miss that part. Few examples on average shortcuts is given in this page below. We try to provide all types of shortcut tricks on average here. We request all visitors to read all examples carefully. These examples here will help ou to better understand shortcut tricks on average.